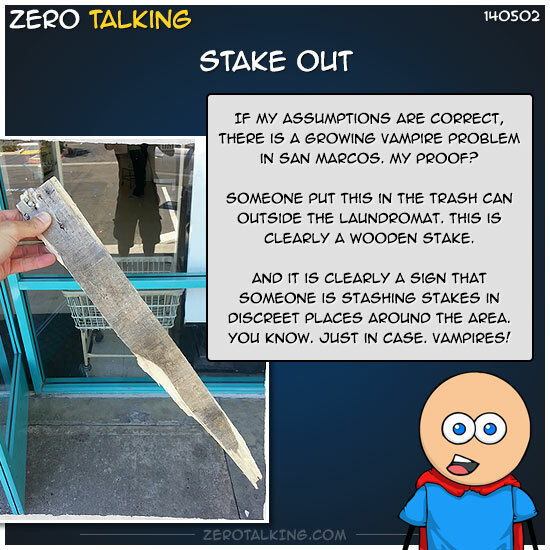 If my assumptions are correct, there is a growing vampire problem in San Marcos. Someone put this in the trash can outside the laundromat. This is clearly a wooden stake. And it is clearly a sign that someone is stashing stakes in discreet places around the area. Andrew: if it were a real problem, either a) it would have remained with the prior owner or b) the pointy end would be covered with remnants of a prior use. Zero: It’s always good to have a weapons cache (was my thinking).